The following website links are associated with All Saints' Church. Link to the homepage for the Church of England. Home to the society that promotes and preserves the use of the Book of Common Prayer (1662). All Saints is part of the "All Saints with St Katharine & St Peter in Northampton" Parish in the Church of England. All that remains of St Katharine's Church is the Churchyard, and a stone marking the site of the High Altar. The Great War Memorial Board from St Katharine's can be seen in the Coffee Shop. We no longer maintain weekly services at St Peter's Church, which is managed by The Churches Conservation Trust, but do take our Sunday Choral Evensong service there about three times a year. Information about the council and town of Northampton, including details on local services. We are proud to be a partner of the Northamptonshire Music Education Hub, of which Northamptonshire Music and Performing Arts Trust is the lead partner. Information on All Saints' Church provided by this online encyclopedia. All Saints is a "Resolution C" Parish and its pastoral responsibility and sacramental ministry is maintained by The Rt. Revd. Norman Banks, Bishop of Richborough. The Royal College of Music; Magdalen College, Oxford; The Queen's College, Oxford; Robinson College, Cambridge; Wells Cathedral; Lichfield Cathedral; The Cathedral and Abbey Church of St Alban; St George's Cathedral, Perth, Australia; St Paul's Cathedral, Melbourne, Australia. A website dedicated to choral music through the churches of England. 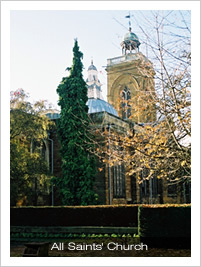 Website featuring a collection of photos of churches in Northampton and the surrounding area. Contacting us could not be simpler and we would love to hear from you. Whatever your requirements may be, please contact us using the information below. If you find any broken links or other problems with our website, please report the problem to the webmaster using the e-mail address below. If you are having difficulties in sending e-mails to us, then please contact the postmaster.